One of the smallest continents yet has 50 countries and close to 750 million people. Rich in history, Europe is the birthplace of western culture and there is just so much to see. Quaint villages, Alps, perfect beaches, castles, rolling hills, great food, friendly people. Live abroad in Europe if you can, you will not regret it! 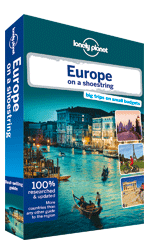 Lonely Planet's Europe on a Shoestring is your passport to the most relevant, up-to-date advice on what to see and skip, what hidden discoveries await you, and how to optimise your budget. It's packed with budget-oriented recommendations with honest reviews - eating, sleeping, sight-seeing, going out, shopping, hidden gems that most guidebooks miss.. By Tom Masters , Anthony Ham , Neil Wilson , Regis St. Louis , Marc Di Duca , Kerry Christiani , Nicola Williams , Anja Muti�? , Duncan Garwood , Mark Elliott , Peter Dragicevich , Steve Fallon , Brandon Presser , Carolyn Bain , Tim Richards , Chris Deliso, Greg Bloom , Luke Waterson , Tamara Sheward , Mark Baker , Oliver Berry , Craig McLachlan , Andrea Schulte-Peevers , James Bainbridge , Anna Kaminski, Andy Symington , Ryan Ver Berkmoes . 8th Edition Oct 2013. . 1264 pages, 64 pp colour, 186 maps.